Irish angler Thomas White had a fantastic session for his first visit to Palm Tree having a number of more than awesome catches. 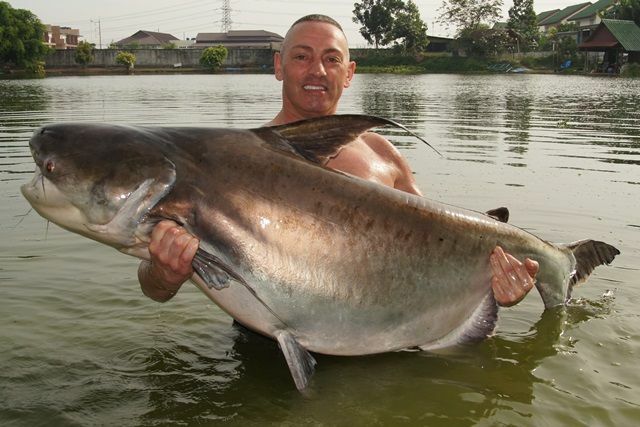 Firstly he caught a 160lb chao phraya catfish earning himself a Palm Tree 150lb Chao Phraya Club t-shirt in the process, and he then followed this up with a lake record 60lb vundu and a lake record Salween rita catfish weighing in at 52lb 5oz. 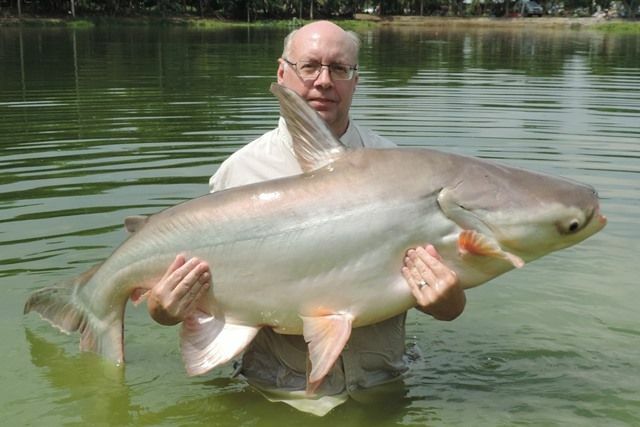 In addition to this he caught a number of other superb fish that included albino chao phraya, black shark minnow, wallago attu, Siamese carp, giant snakehead, Mekong catfish, mollycot, big-Y catfish, pacu, clown featherback, yellow catfish, arapaima, Chinese black carp, tambaqui, rohu, striped catfish, catfish shark, and numerous big Amazon and Thai redtailed catfish. 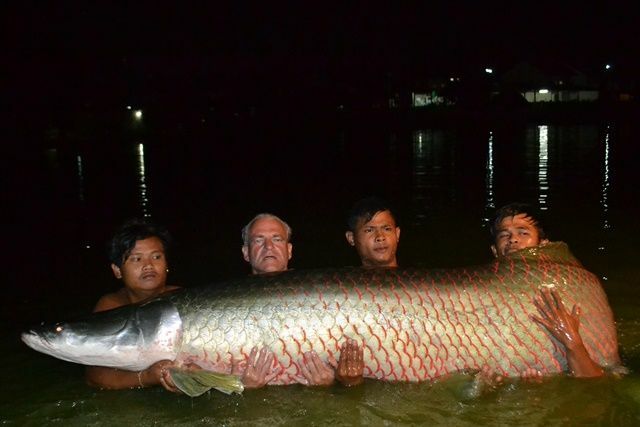 David Gordon was back and after having never caught an arapaima on previous trips, this time he managed to catch four in a single day culminating on the last cast with a 420lb+ monster known as the green arapaima that hadn't been caught for almost two years. 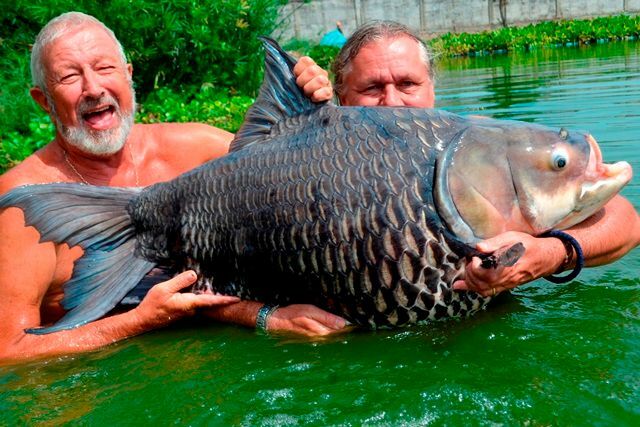 This of course put him into the elite Palm Tree Lagoon 400lb Arapaima Club. In addition to this it had been all smiles all session with a number of superb catches that included tambaqui, catfish shark, a pb Siamese carp, ripsaw catfish, alligator gar, big-Y catfish, Mekong catfish, wallago attu, some awesome rohu, striped catfish as well as both Asian and Amazon catfish. 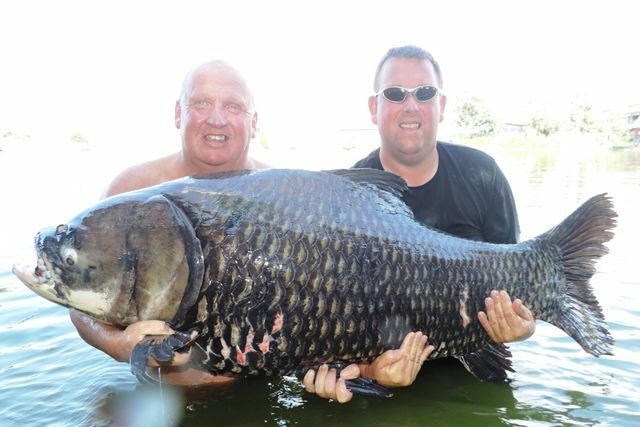 Wayne Murray returned to continue his quest to get a Palm Tree Lagoon 150lb Carp Club t-shirt and this time he was more than successful catching four 100lb+ Siamese carp in all the biggest weighing in at 165lb. 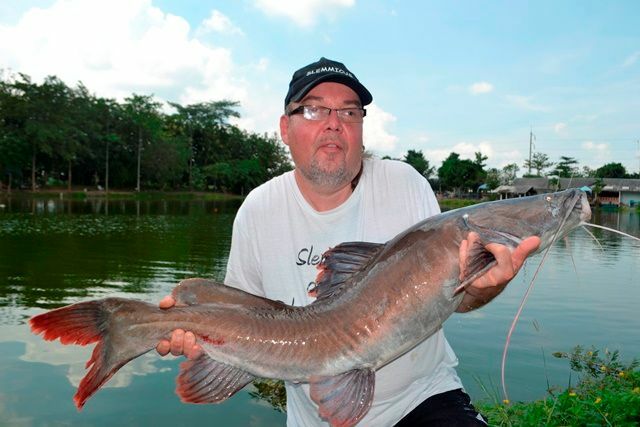 In addition he caught a couple of very chunky Mekong catfish and Amazon redtail. 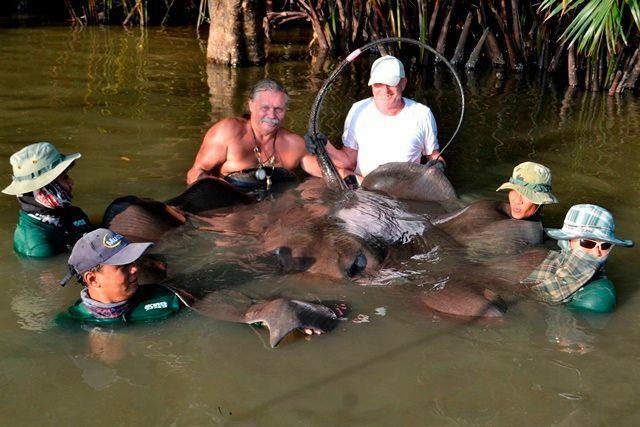 Eric, Brett and Copper also had their first experience at giant freshwater stingray on the Mae Klong during the month. This turned out to be very successful with everyone catching and being topped off by Copper hooking and landing a 500lb+ river monster just as we well packing up for the day. 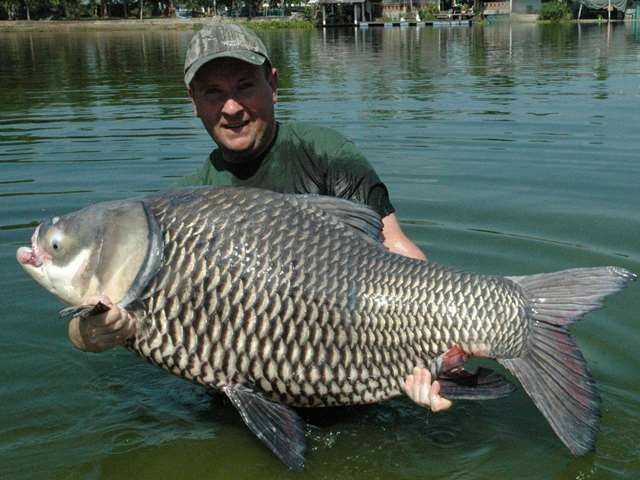 This awesome fish also qualified him for the Palm Tree Lagoon 500lb Stingray club .... much more than awesome. Tonio de Clercq made his first visit and he was quick to state not his last stating next year he will definitely be back. 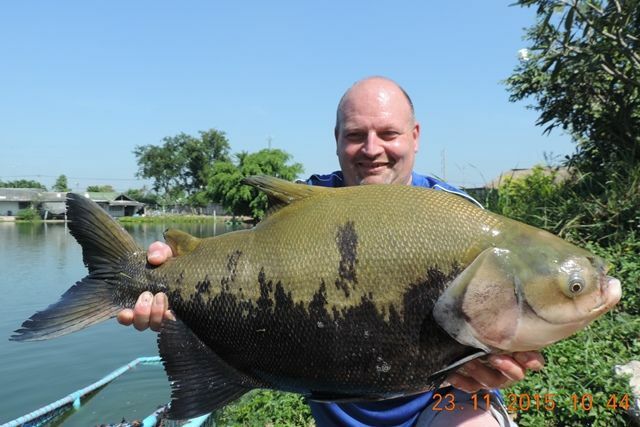 He caught a great variety of stunning fish culminating in his first 100lb+ Siamese weighing in at 57kg. 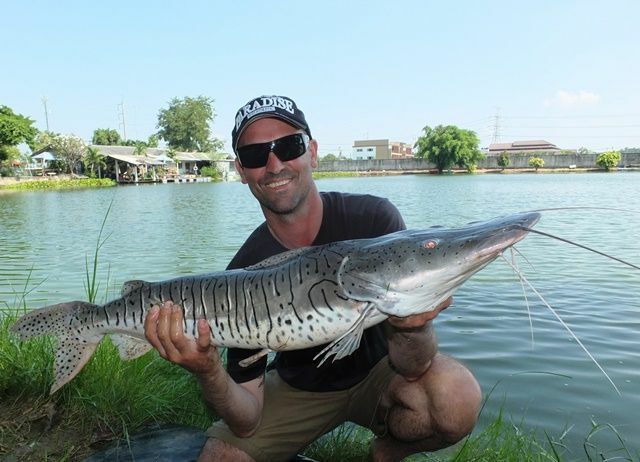 As well as this he successfully caught an awesome bearded labeo, stingray, tiger catfish, alligator gar, big-Y catfish, Mekong catfish, mollycot, catfish shark, striped catfish, rohu, mrigal and lots of both Thai and Amazon redtails. 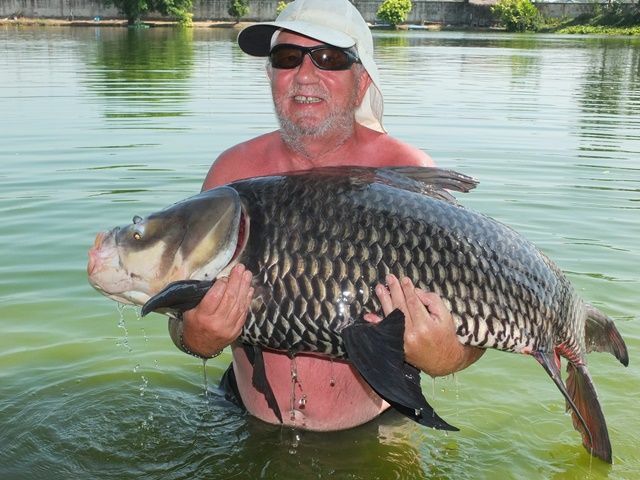 John Wilson was back again and was pleased to finally caught his first 100lb+ Siamese carp. 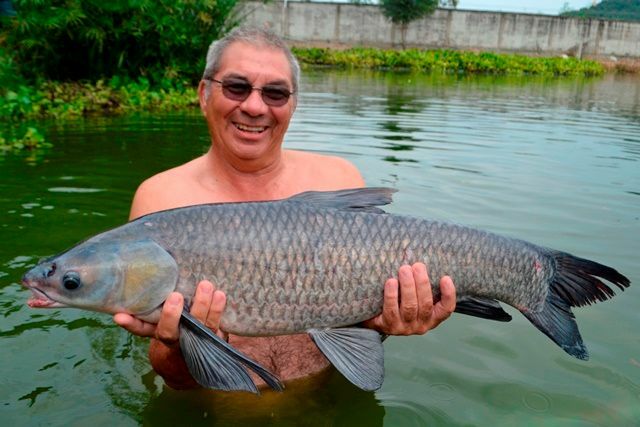 In addition he unsuccessfully battled a giant Mekong catfish for three and a half hours, but did catch a number of other splendid catches that included his first soldier river barb, his first Chinese black carp, his first crystal eyed catfish, rohu, pacu, and a number of good sized Mekong and big-Y catfish. 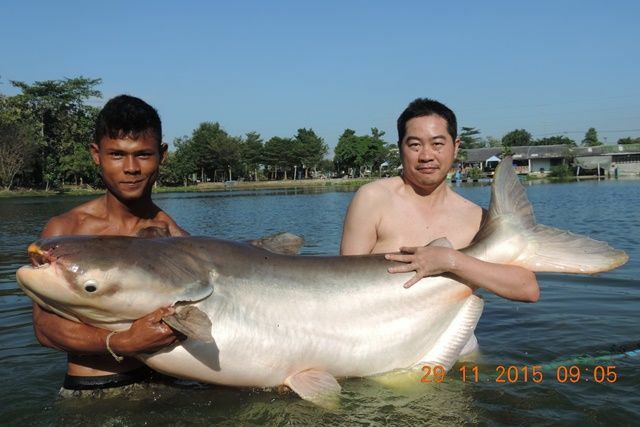 Tap from Bangkok Fishing Guide Service made his third trip down for the month and his customer successfully caught some cracking Mekong catfish as well as Siamese carp, black shark minnow and Amazon redtail. 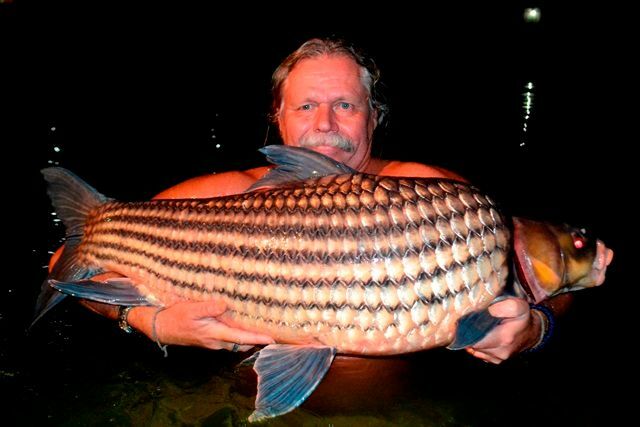 Christian Huybrecht was another angler who thoroughly enjoyed his time at Palm Tree vowing to be back next year. 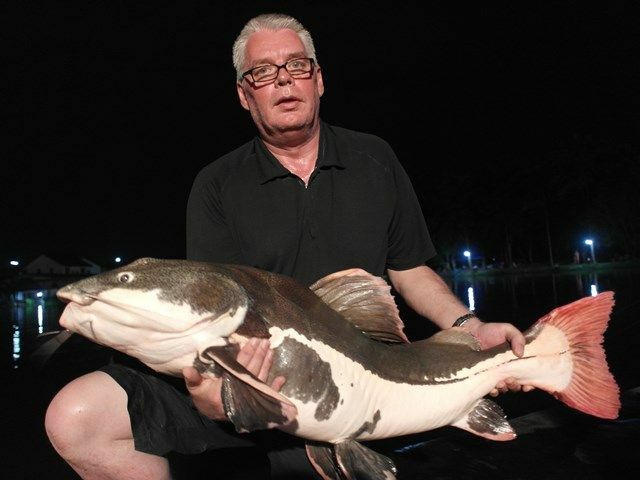 after catching a swag of fish that included tambaqui, Mekong catfish, big-Y catfish, alligator gar, arapaima, black shark minnow, chao phraya, mollycot, rohu, wallago attu, as well as both Asian and Amazon redtails. 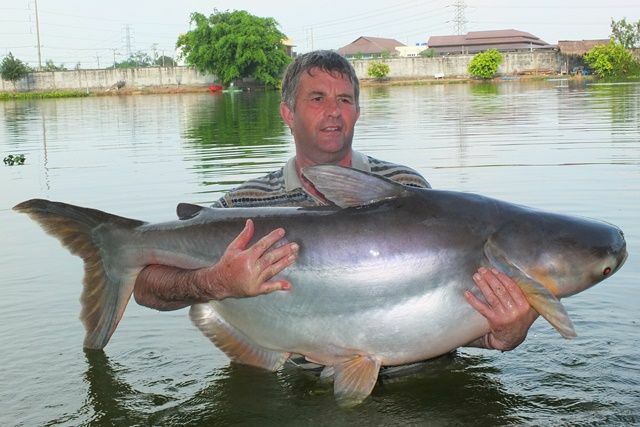 Neil Robinson of Khao Lak Fishing Tours came down with one of his customers who caught a number of stunning catches such as a lake record Big-Y catfish, a pb Mekong catfish, a pb Siamese carp and Amazon redtails. Swedish anglers Stephen Blenk and Effe returned to Palm Tree still sporting their local fishing club t-shirts as they did last year with the slogan 'Slemmicus on tour Palm Tree Lagoon'. 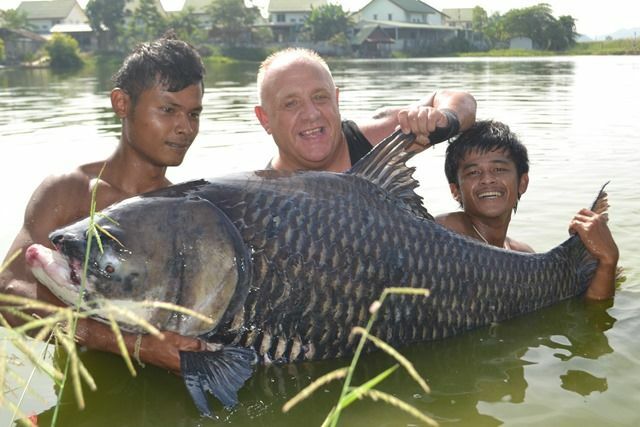 This seemed to bring them some good fortune as they went onto to catch a wide variety of species including giant snakehead, wallago attu, arapaima, crystal eyed catfish, Siamese carp as well as both Asian and Amazon redtails. 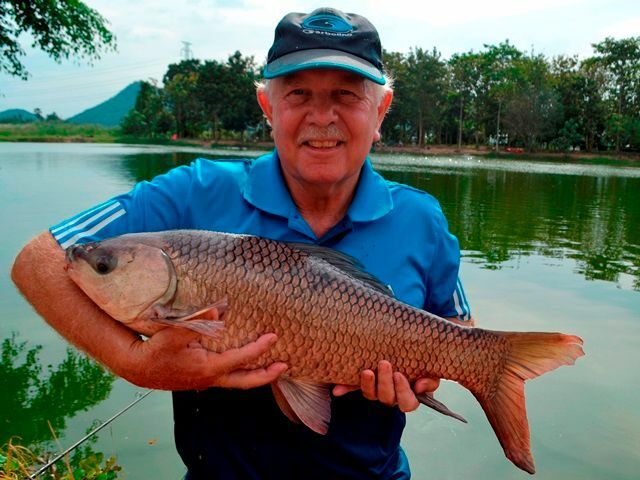 Richard Clarke and Tim were back at Khao Laem Dam this time fishing for the various carp species that frequent the dam. 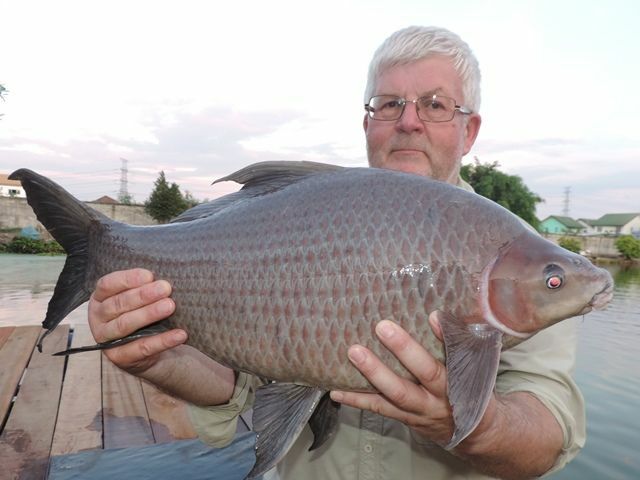 Although the water level was too low for the rohu to come in from the depths they did catch some stunning other species such as yellow catfish, black shark minnow and Java barb. Richard Ma was back after an absence of about a year guiding a couple of American angling buddies. 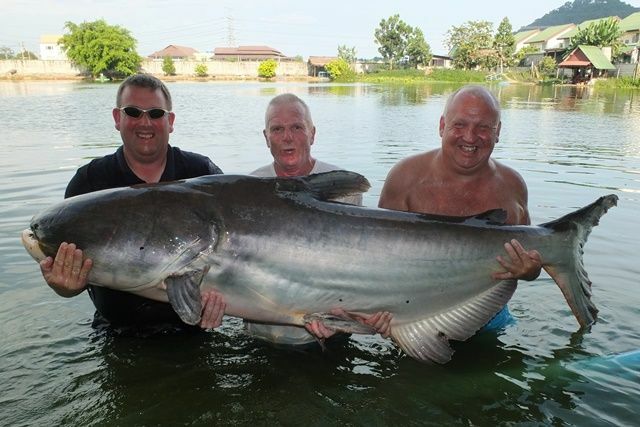 They had a number of great catches during the day that included ripsaw catfish, rohu, Chinese black carp, stingray, Thai and Amazon redtails, striped catfish, catfish shark, and the day was finished off in style with an arapaima which had been top of their wish list. 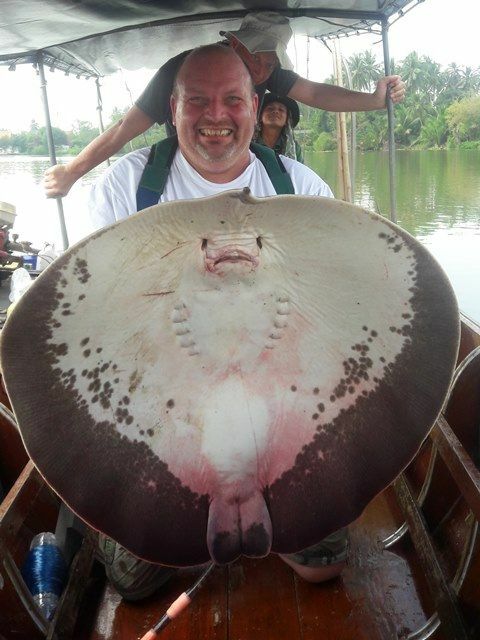 Richard Clarke joined Tim for his first giant freshwater stingray expedition on the Mae Klong. The bull sharks were out in force but they did manage to get a 500lb+ stingray in the end. 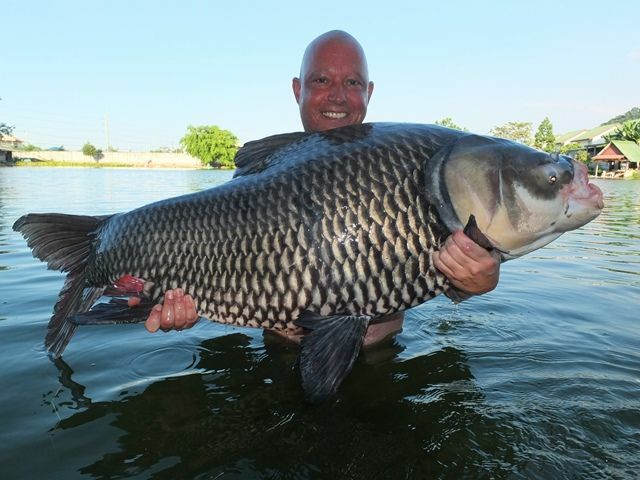 Tim was back setting a new Palm Tree Lagoon Juliens golden price carp record at 60lb 2oz as well as catching African arawana, Siamese carp, Chinese black carp and bony lipped barb. 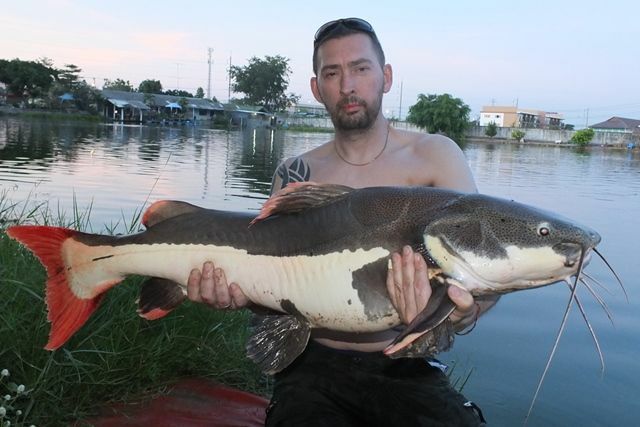 Jeff Vaughan and his mate Colin made their first visit to Palm Tree during the month and caught a number of different species which included a pb Siamese carp for Jeff as well as some nice Mekong catfish, mrigal, a rohu x black shark minnow cross and Asian redtailed catfish. 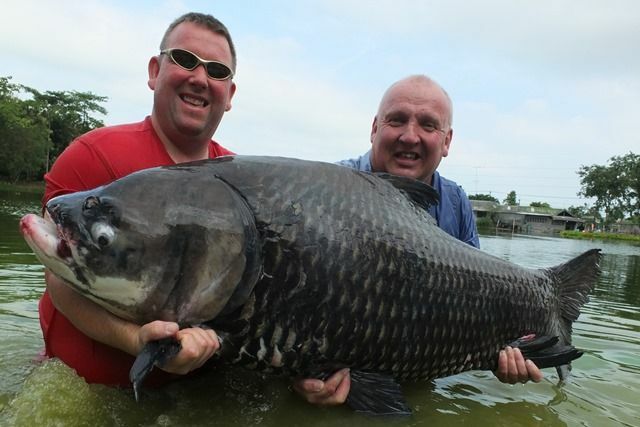 A Korean Film Crew turned up and as well as taking some footage of the lake and some of the other anglers catches they also caught a number of fish themselves which included stingray, rohu and giant snakehead. 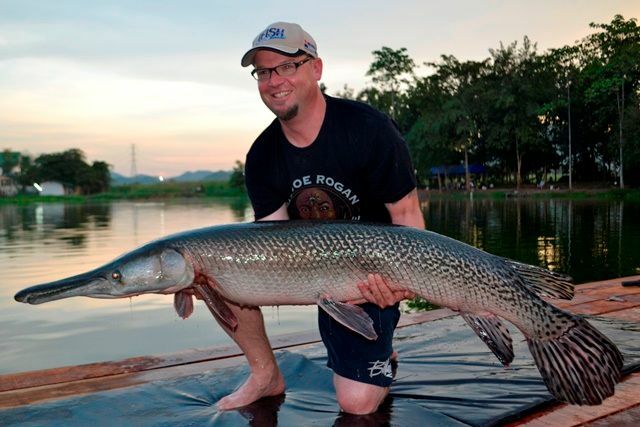 West Australian angler Jordan Reid returned this time catching an awesome alligator gar as well as chao phraya and an arapaima. Japanese angler Mikaya Furumoto was interested in catching one of our very elusive peacock bass. 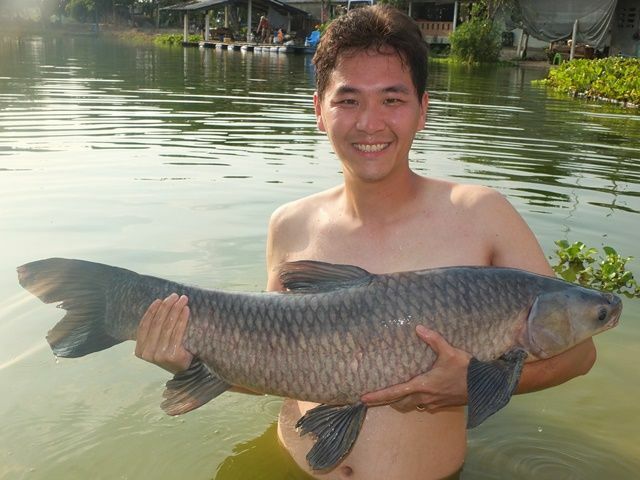 Although he didn't manage one he was more than happy with his catch of a stunning tiger catfish and his first arapaima. 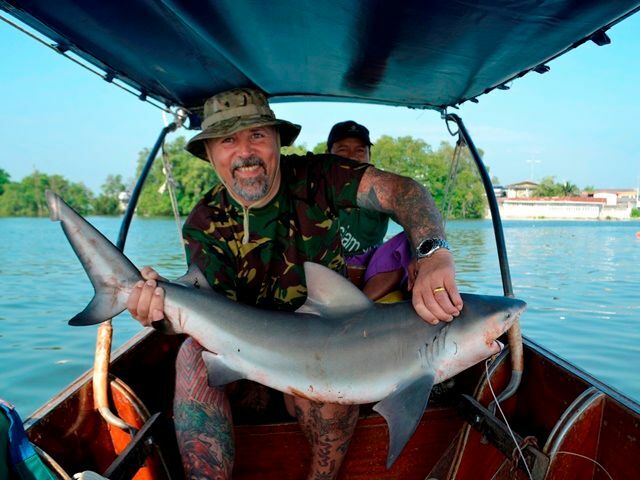 Tonio de Clerck and Chris Huybrecht tried there hand at catching the giant freshwater stingray on the Mae Klong River. Although they didn't catch any monsters this time they did catch several smaller ones vowing to be back after their 'mothers' next year. 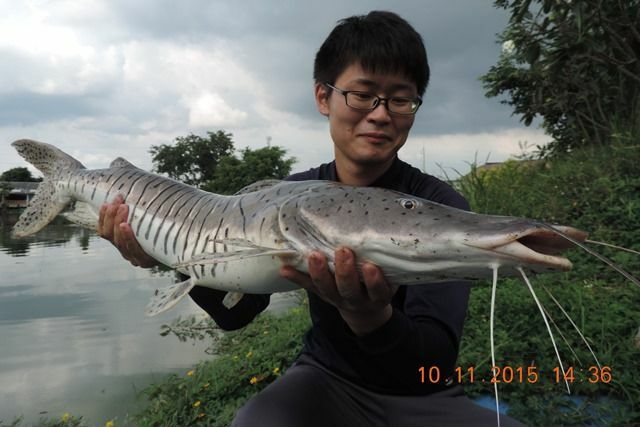 Tap of Bangkok Fishing Guide Service made his first visit for the month and his customers were happy with their catches of Mekong catfish and Amazon redtails. 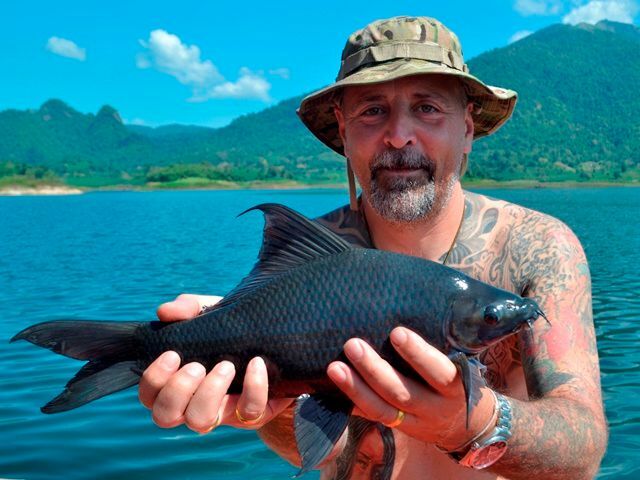 Paul Clapham also made his first trip to Palm tree during the month and was managed to catch a Chinese black carp as well as Amazon redtails and striped catfish. Chris caught some nice Amazon redtails and striped catfish during his first visit to Palm Tree. Barry Gregory and Ian Watson came down for a quick visit and in between the plaque of striped catfish they did manage to get some rohu and Amazon redtail catfish.